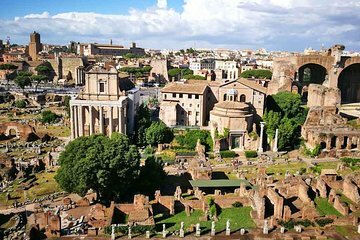 Aprende sobre la antigua Roma con un guía local. Tamaño de grupo íntimo con 12 personas máximo. Esto va más allá de otros recorridos para incluir tanto los niveles de metro restringidos como los niveles superiores, también conocido como el mirador. I had visited the Colosseum several times previously but this tour provided a completely different perspective. Visiting the underground areas and the higher tiers of the structure gave an actual working concept of how the events were staged and how the Colosseum was organized.Our tour guide, Vincenzo also escorted the group to the Palatine and Forum areas. I found him to be extremely knowledgeable and enthusiastic and he provided a lot of historical information on the sites visited. My only wish was that the tour was too short to encompass three very important historical areas. It would be improved, in my estimation if an additional hour could be spent on the walk down to the Forum and exploring some additional areas of interest within the Forum itself.All in all, a great tour with an excellent guide. Highly recommended.Additionally, if you take this tour, there is a lot of walking required and a significant number of steps. Wear comfortable shoes and be prepared. The tour of the Colosseum was great. We got to see underground then up to the highest rows up, which was a restricted area that only our group could go to. The tour of the forum was however rushed with not much explanations. Our guides Francesca and Maria made this tour very interesting for us! I really enjoined it and learnt many new things about history of Rome! This tour costed more than I wanted to spend on the Colosseum, but it was more than worth it!! Seeing the lower area, as well as all of the upper areas was just incredible! The tour guides were extremely knowledgeable, answered all of our questions, and made the experience even more valuable than I thought they could. Seeing the Colosseum is an experience you'll never forget, and if you think you're probably only going to see it once, this tour is the way to do it! What a comprehensive and informative tour! We had the tour representative who prepped us and conducted the Palatine Hill portion as well as a knowledgeable archeologist who walked us through the Colosseum. She made it come alive with details and anecdotal information. We especially enjoyed visiting the below level areas and the topmost tiers. The only downsides were the crowds in he shop attempting to purchase water and the searing heat of this particular July in Rome! My sister and I had a fabulous tour with Monica. The morning began at the top of the stairs outside the metro. The company provided very helpful instructions on how to find the meeting place. Monica then took us to the special entrance for the Collosseum and followed behind as we took a tour of all sections of the collosseum. Going to the highest level was a truly special experience. It was great to see not only the underground level but also the view from the top. My sister and I felt very lucky to be ushered into areas that general ticket holders weren’t allowed to go. After the tour of the Collosseum, Monica led us on a great walk up Palentine Hill and down into the Roman Forum. She was extremely knowledgeable and fun to talk to. The tour ended at the Piazza Venezia. We had a great time and highly recommend the company and particularly our guide Monica. When you start this tour you will be happy right away. As you enter the arena floor you see all the people that don't get to go where you are. You hit all the levels and there is most definitely a huge difference in all the places you go opposed to the the standard. Being so high up on the Belvedere is a spectacular view and both guides were extremely knowledgeable. We started in a group of six with our guide Beatrice who was wonderful. Once we got further inside we met another Beatrice who was an archeologist and had a group of about 20 people. We got headsets and toured the areas of the colosseum. Cant say enough. Just wow! After that we went back to our original 6 and continued to the ancient city which was just as riveting. Fantastic day and tour!